The CANcheck tester for CAN networks. CAN + Automotion Pty Ltd’s CANcheck allows a simple test of CAN networks during start-up, troubleshooting and maintenance. The battery-operated, handheld device is connected to the CAN network to be tested and operated via cursor keys and a graphic LCD display. The test results can be output via the LCD display or via a PC connected via a USB port. The scope of supply includes all tests that are important for testing and commissioning CAN systems, such as a wiring test when the network is switched off and an operational test when the network is in operation, a test of the resistances between all pins of the CAN connector, a terminal resistance test and measurement of the signal level. In addition, the cable length, the baud rate and the bus load of a system can be determined. All identifiers transmitted in a system can be scanned and displayed. It is also possible to display the error frames received per time unit. 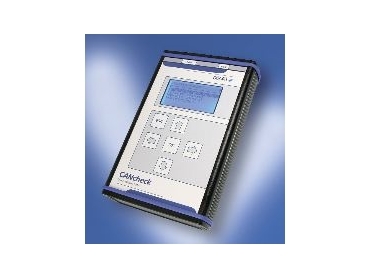 CANcheck has a high-speed CAN interface in accordance with ISO/IS 11898-2. Four mignon batteries (AA) are required to power the device. The average operation time is about 24 hours. The device has a robust, aluminium housing specially designed for use in the field.